From the rehabilitation of the original flower beds in front of the “old” Library, to the additional plantings in the expanded side beds and patio beds on the back at the “new” Library, the Towns Union Master Gardeners Association, TUMGA, has worked diligently to enhance the appearance of the outside public areas of the Library. 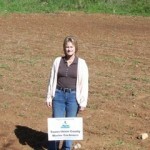 Maggie Oliver, MGEV, is the coordinator of the project and managed to keep construction damage to a minimum. 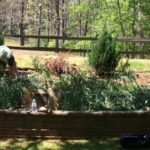 She planted the side beds three years ago with heirloom iris and daffodils and is anxious to see how they survived the project! 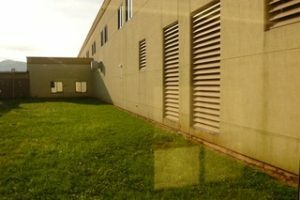 Prior to construction, watering of the beds was done with 150 feet of hose from the back of the building where the only outside spigot was located. The idea of a rain barrel was born before construction started, but delayed until the project was completed. 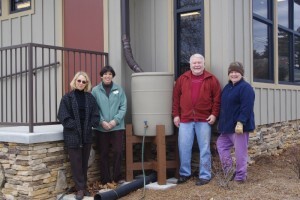 The rain barrel was donated by UGA Towns Extension Service and the MGEV’s took over! 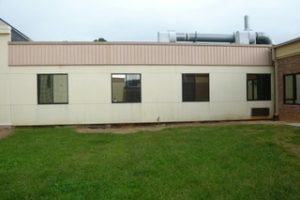 It had to be painted to match the building, needed a base to sit on, as well as connections for the internal parts and screens. 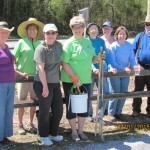 This year, thanks to this talented group of Master Gardeners who did all of the work, watering will be much simpler. 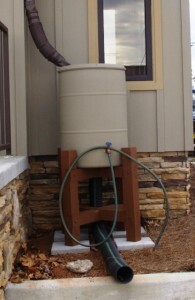 The rain water from the barrel will be used, which is chlorine free, a bonus for the plants. 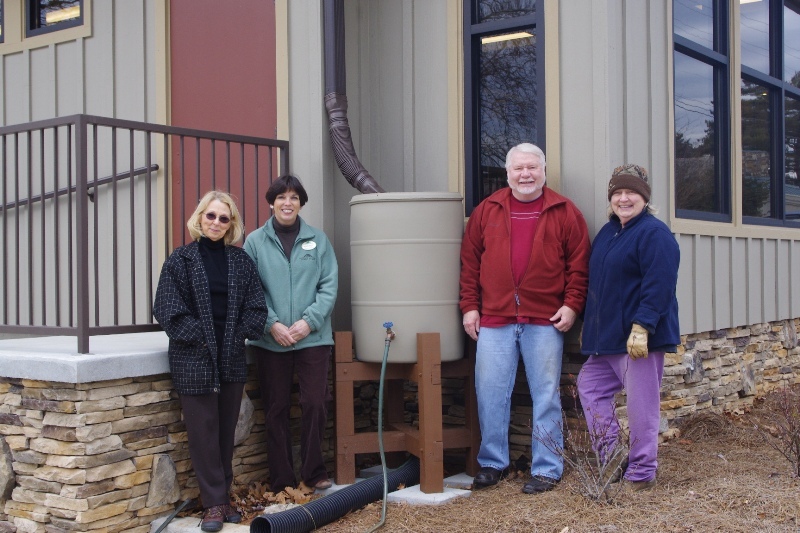 This is the only rain barrel in Hiawassee at a commercial facility, and may well be the only one operational anywhere in the city! Ms. Phillips, Director of the Hiawassee Library, is pleased to be able to share this project with the community and with the children in the summer educational programs at the Library. Check it out. You might want one at your house! 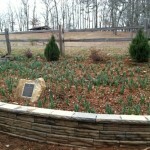 Master Gardeners have been working with the Am Yisrael Chai Project Coordinator, Mike Weinroth and Commissioner Lamar Paris, Union County since the summer of 2014 to create a memorial daffodil garden in Meek’s Park. 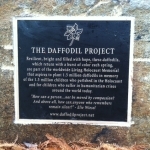 The bulbs were planted to honor the memory of the children who perished in the Holocaust. It is the goal of Am Yisrael Chai to plant 1.5 million bulbs worldwide in memory of the 1.5 million children who died in the Holocaust, a Living Holocaust Memorial. 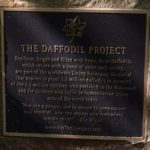 The total number of daffodils planted since 2010, when this project started, is 77,558. 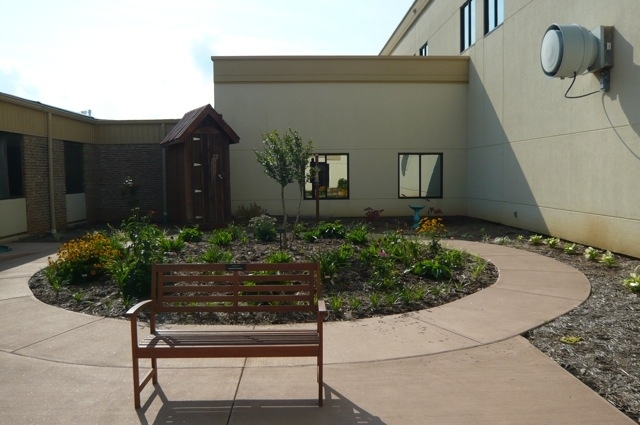 The garden is located adjacent to the Children’s Memorial Garden and has followed a complementary layout to work in conjunction with it. 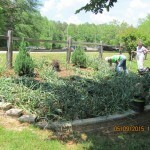 The back ground plants installed were two “Blue Point” Junipers and three Loropetalum “Daruma”. 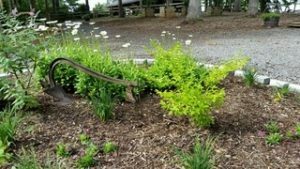 We will be doing a little more planting after the daffodils bloom in the spring to add some color and texture for the balance of the year. 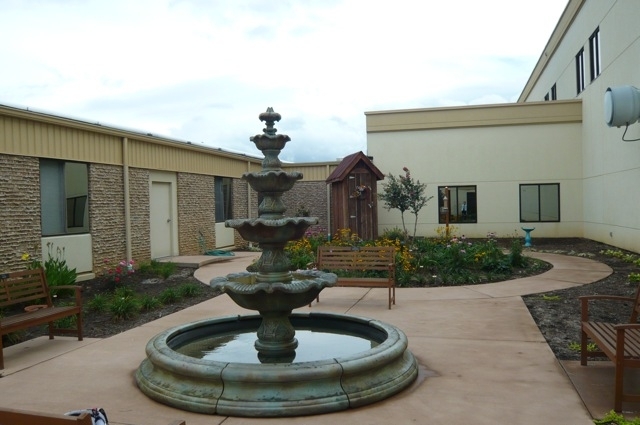 The dedication ceremony was held on Sunday, November 2nd, 2015 at 3:00 pm and was attended by approximately 100 members of the community. The attendees were invited to plant a daffodil bulb in mem”ory of a child who perished in the Holocaust with a sheet in the program with information about a specific child making it very moving. Master Gardener Extension Volunteers demonstrated to the community the proper way to plant the bulbs and a pamphlet was provided to anyone interested on planting in their own gardens. 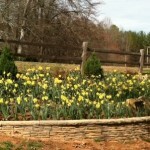 There are 600 daffodil bulbs planted in the garden. 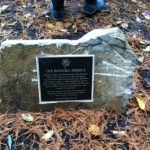 A beautiful plaque has been installed and was officially unveiled at the dedication. 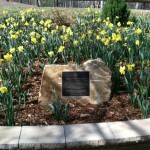 The daffodils in the Children’s Daffodil Garden at Meeks Park are in full bloom. 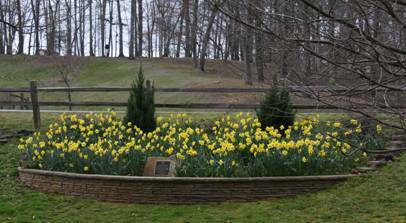 The damp and cold afternoon of November 2, 2014 did not stop approximately 115 residents of Union County from coming out and planting 600 daffodil bulbs in memory of those children who perished in the Holocaust. 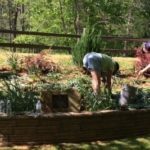 The Garden is part of an initiative started by the Atlanta-based organization, Am Yisrael Chai, whose mission is to plant 1.5 million bulbs worldwide for the 1.5 million children murdered during the Holocaust. 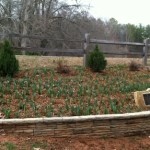 Mike Weinroth, the Project Coordinator, stated that more than 45,000 bulbs have been planted to date. 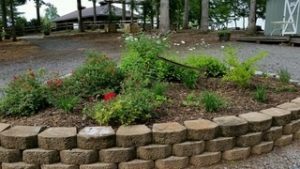 Mike Weinroth along with Blairsville resident Steve Mack gained the support of Union County Sole Commissioner Lamar Paris before moving forward with the planting of this garden. 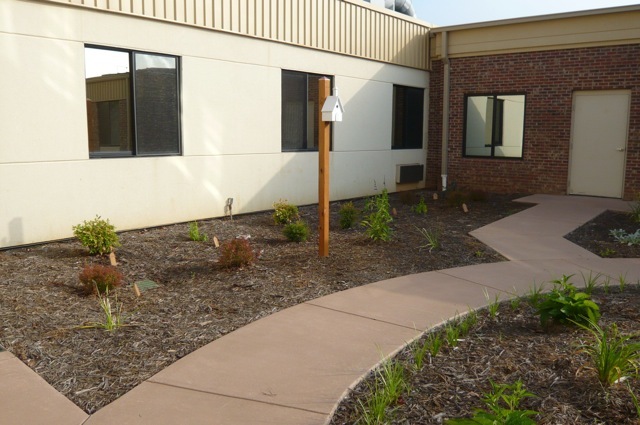 Mr. Weinroth contacted the Master Gardeners and they worked tirelessly in all stages of this project, from planning to implementing, along with Meeks Park Manager Larry Conley and his staff. 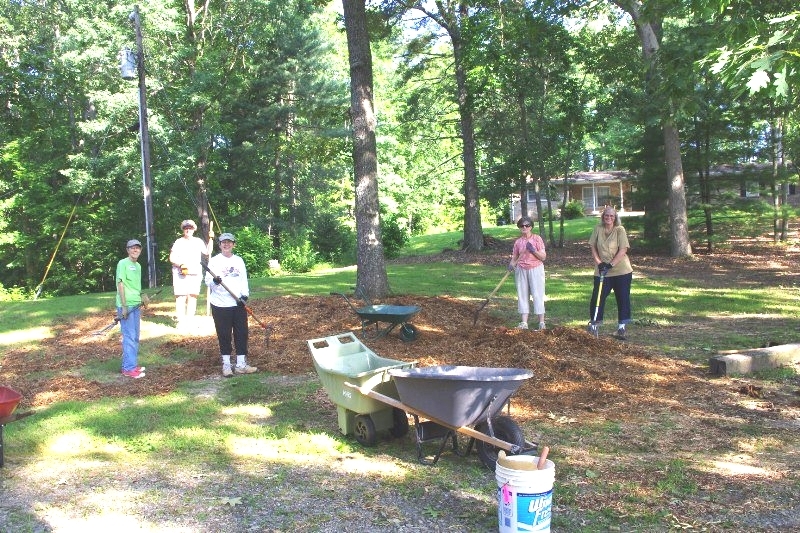 Master Gardeners assisted in site selection to make sure the new Children’s Daffodil Garden fit nicely into the original Children’s Garden area. 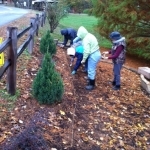 They researched and selected shrubbery to be planted at the back part of the garden as a back drop for the 600 daffodils that were to be planted at the front part of the garden. Brochures were created for education on planting bulbs, education being the primary goal of all Master Gardener Extension Volunteers. 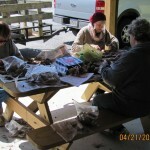 The Master Gardeners pre-planted many of the bulbs the day before the Garden dedication, a real work of love accomplished in the sleet and snow flurries, to assure that all of the 600 bulbs got planted. 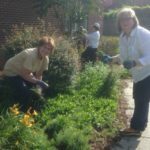 Both children and adults of Union County aided by several of the Towns-Union Master Gardener Extension Volunteers planted the remainder of bulbs in the Children’s Daffodil Garden at the Garden dedication. 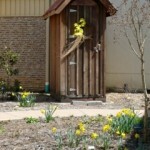 Daffodils, with their burst of color each Spring, represent renewal of nature after the harshness of winter. 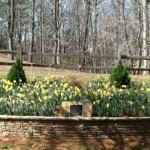 Come out to Meeks Park and enjoy the beauty of the daffodils. 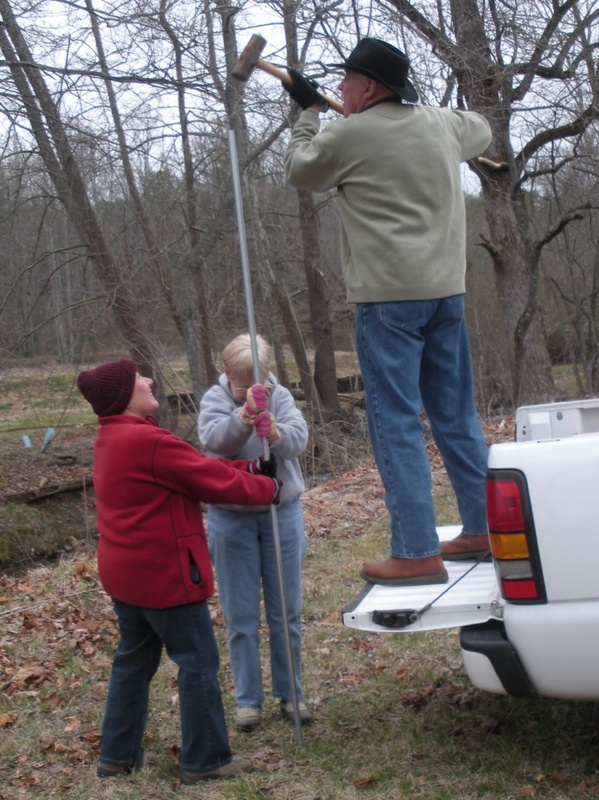 A BIG THANK YOU to Barbara Baumgardner and Bert Baumgardner and Tom Allen. 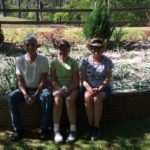 Bert and Barbara and I weeded the Children’s Daffodil Garden, fertilized the garden, planted hostas and lysimachia (as called for in our initial garden design), and replaced/planted one of the loropetalums that did not survive this past winter. Tom went to Buds and Butterflies and got our replacement loropetalum at no cost. 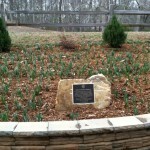 Hostas and lysimachia were donated to the Children’s Daffodil Garden from Jo Anne’s garden. The garden is once again beautiful, loropetalums are blooming and it is now weed-free. and our “customers” on Saturday really seemed to appreciate our being there. 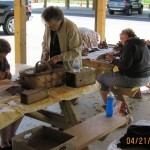 The hours on Saturday are 9:00 – 12:00 and we invite you to come check us out if you are in the area. It is always an “interesting” place with all the beach and pickle ball and fair grounds and Hamilton Gardens traffic, as well as farmers market traffic, coming and going!!!!!!! The Towns County Farmers Market has closed for the 2016 season. 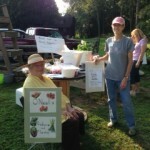 Since May 14, there has been an “Ask a Master Gardener” booth every Saturday that the market has been open. We averaged between 20 and 30 folks who stopped by the booth each week to chat and ask questions. We had lots of printed information available on a variety of topics. Much appreciation goes to those TUMGA members who “manned” the booth on these 20 Saturday mornings that the market was open. 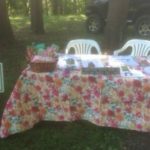 Towns County Farmers Market: In cooperation with the Extension Advisory (ELS) Committee, operate a weekly Farmers market during the growing season. Volunteers serve as ‘market managers’ during hours of operation. 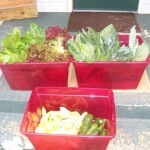 We don’t charge any fees for local farmers/residents to sell vegetables that are more than they can eat! We currently have 13-15 vendors each week. Saturdays, from 9-12AM. 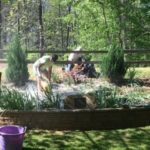 Towns County After School Program – Farm to Table: Assist the program director and staff in implementing their vegetable gardening project. This includes use of the greenhouse, building raised beds, planting seeds in raised and salad beds, vermiculture (ie: raising earthworms for their excrement as fertilizer), etc. 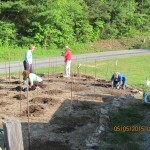 2014 one-time purchase 10 yards of soil to add to raised. 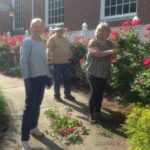 Towns County Courthouse: Weed and supervise detainees to add mulch, provided by county, as needed. 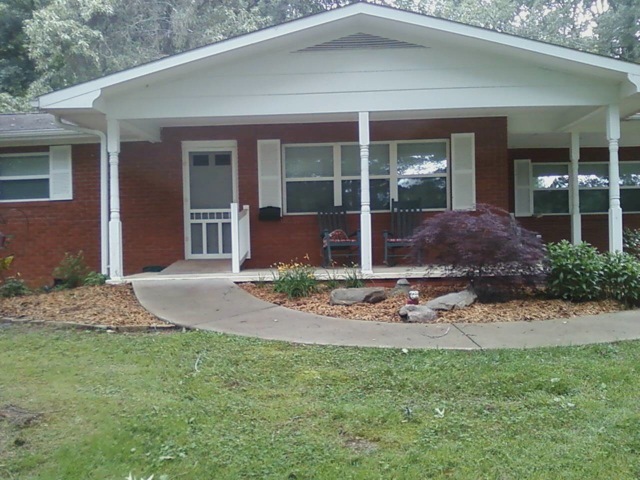 Add 2 bush type plants (looking at camellias) by front entrance. 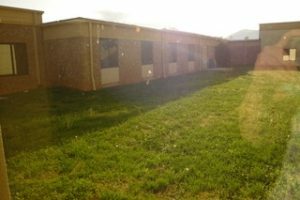 Hiawassee Library: Re-design beds when construction is finished. Create new plan for the old jail. 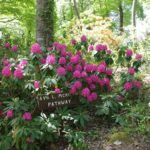 Participate in the summer reading program again, with a focus on plants. 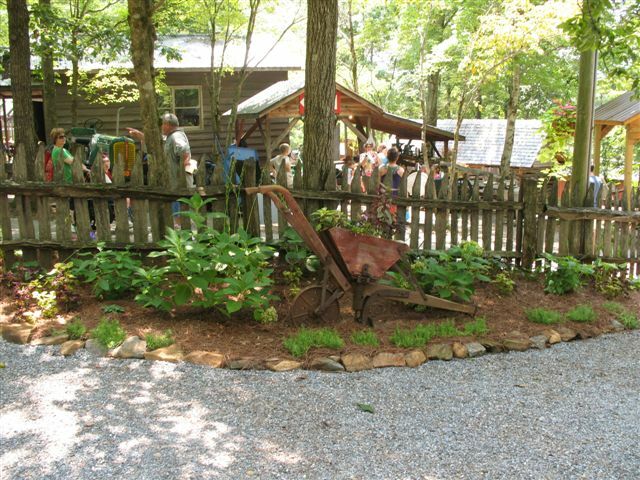 Gold Medal Garden at Union County Farmer’s Market: Educational garden containing Georgia Gold Medal Plants; requires regular maintenance and new plantings yearly to add to the garden. The Gold Medal Garden at the Union County Farmers’ Market is in dire need of weeding. Since everyone is very busy working in their own yards as well as MGEV projects, I decided that it may be more convenient to you to Meet Me In The Garden (Gold Medal) at your convenience! 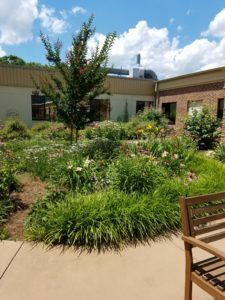 The Gold Medal Garden at the Union County Farmers’ Market in Blairsville still looks wonderful even though blooms are dying down. 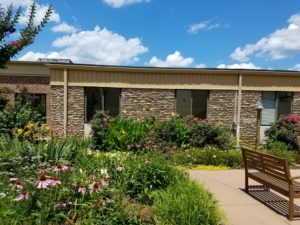 The next visit by members will be scheduled for the last week in October or in early November to retrieve seeds from spent blooms and prune down perennials left standing from our last visit. 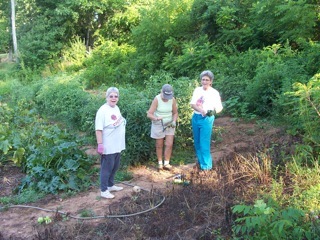 The roses will also be pruned down; and, we’ll all share in discussion of the Beautyberry that is blocking the walkway. The correct Gold Medal winner variety has been purchased and we’ll discuss where it needs to reside. 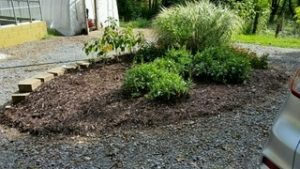 We also need to re-do two perennials beds that have been taken over by wild violets and a time frame as to when we want to attack and what we want to reinstall. 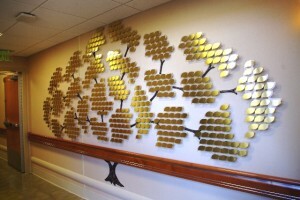 What a perfect update to the Gold Medal Garden – This is August’s report!!!!! Everything blooming with the glory of our wonderful mountains as a backdrop. What human could have done such beautiful work?! 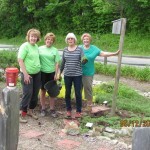 We Master Gardeners just like to dig in the dirt and the results are not totally ours. The beautyberry that is blocking the walkway probably needs to be removed ; but, there are still two remaining. Will pursue removal ceremony in the Fall. Will begin deadheading the black-eyed susans, small amounts at a time to leave some for the birds. Will leave the seed heads of the coneflowers for the birds and will remove the stalks in the late Fall or late Winter (some seeds should fall to revitalize the bed) Speaking of coneflowers – the bed has been taken over by wild orchids and the bed needs to be re-worked next Spring. 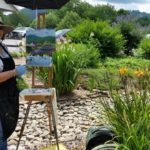 MGEV Cathy Haist reports the following: “As I was leaving the Farmer’s market yesterday, I noticed an artist painting in the Garden. 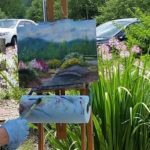 She had captured some of the Garden with the mountains behind on her canvas. I just had to take pictures of her work to share with you. 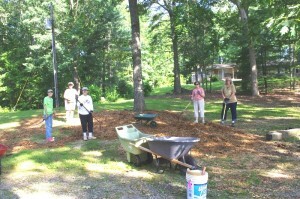 o Weeding is soooooo minimal since the mulch was added by the County!!! o A second family of “field swallows” has fledged – what fun to garden with them. o Battle is ALMOST over with Japanese Beetles and Milkweed bug – but the squishing continues for a while longer. 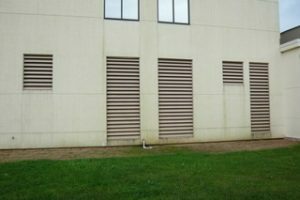 – GREAT TIME TO SOCIALIZE IN THE A/C! 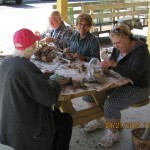 Have you seen the garden lately – Merrily, Merrily applies! 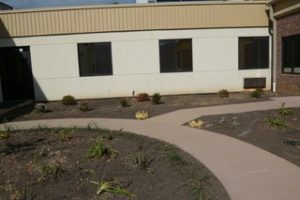 New mulch has been applied and more rock have been installed to help the “wash” during torrential rains. Weeds have been sprayed in the “dry ditch” and everything is perking up beautifully! Still awaiting the Clethera to emerge, but all other residents seem to be doing just fine. Plant ID “tags” will be elevated for easier viewing and Small Metal Markers will be installed to identify all Non-Gold Medal Plants. 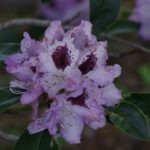 For all you recent graduates (Trainees) I encourage you to take a walk through the garden, use the posted map to locate and identify the plants, learn what Gold Medal Plants are (use the internet to tell the history) and enjoy the season long beauty. 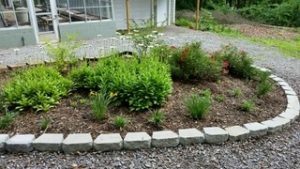 I am seeking suggested ANNUALS from the Gold Medal list to create a small annual flower bed at the entrance to the garden. It will, too, be outlined with rocks and some prep work will also have to be done. So send me you suggestions! Cletherea ‘hummingbird’ was purchased as this year’s major addition. Sorry to say they expired and have been returned for replacement. I did plant five (5) small plants that I dug and grew from my yard. The Amsonia that JoAnne has been growing have proven to be more difficult to grow from seeds and seedlings. Thank you JoAnne for ALL the time and effort it has taken. I will be looking for larger plants in the meantime. JoAnne has graciously offered to continue the vigil of raising the babies she has – THANKS. 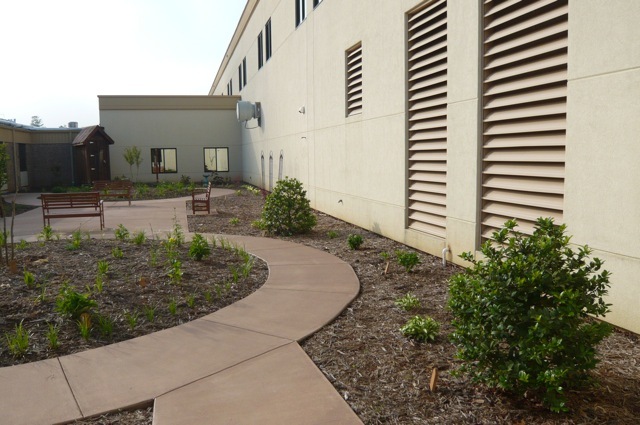 The larger plants, once located, will probably be in 2016 budget for next year’s planting. JoAnne provided a flat of pink and white mix cleome. 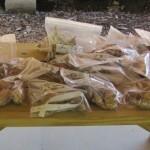 However, there are 1 Billion seedlings already in the garden (I counted) and we may hold off on adding more. 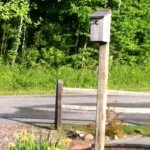 There is a pair of Meadow or Field Swallows (I believe, as they are a beautiful blue) currently building a nest in the birdhouse that was placed in honor of JoAnne’s Mom. JoAnne provided “Red Hot Poker” and they were split and planted in front of the electrical box and telephone pole on the West side of the garden. We were able to talk with Mickey about needing mulch, etc etc etc. 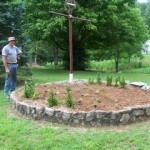 You will be happy to know that he will talk with both Larry and Lamar in hopes of also getting “egg” rock to be placed in the garden to help with the mulch staying put to avoid drainage issues. 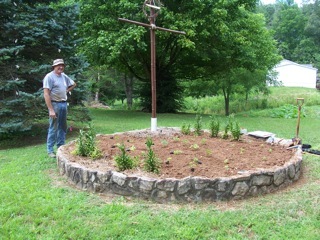 Mickey suggested mulch around the plants and “egg” rock elsewhere. This conversation and request will be continued, but I just wanted you to know that Mickey is on board with helping to cut down on the weeds and also adding beauty to the garden. Mickey’s comment was that this may be a large expense initially, but will pay off may times over – YEA!! 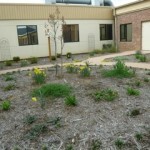 WOW, What a Garden – thanks for everyone’s help! 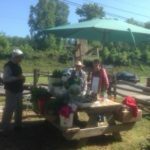 Gold Medal Plant Garden at the Union County Farmers’ Market! 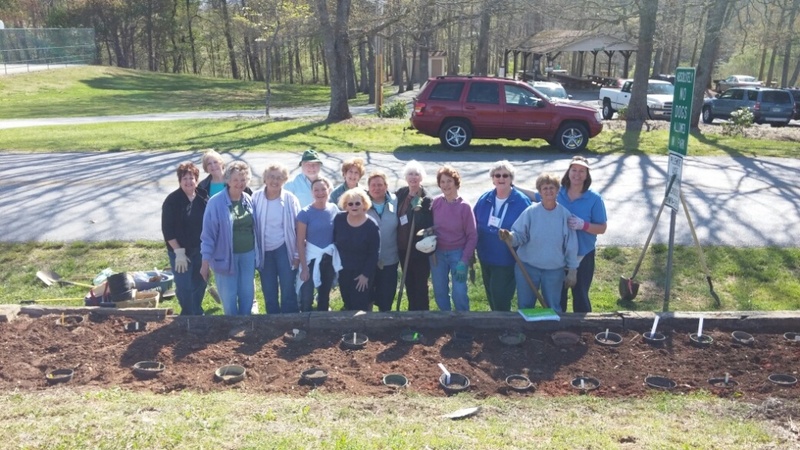 The County’s experienced and talented Towns & Union Counties Master Gardeners were hard at work performing Spring gardening chores in the beautiful Gold Medal Plant Garden they designed and installed in 2009. 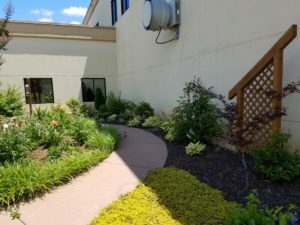 Once a parking lot drainage area, the Master Gardeners transformed an unsightly area into a learning garden of specially selected Gold Medal Plants. 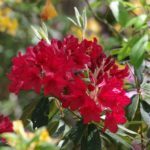 Gold Medal Plants derive their prestigious name from a selection of vines, shrubs, trees, ground cover, perennials and annuals that are nominated and then selected by a committee to be “the chosen” for each year. 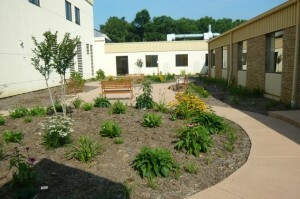 The plantings selected for Union County’s Gold Medal Garden were specifically selected for growth in this area. 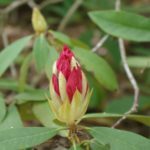 Plantings were also selected to provide flowering throughout the growing season as an example to residents of Union County. 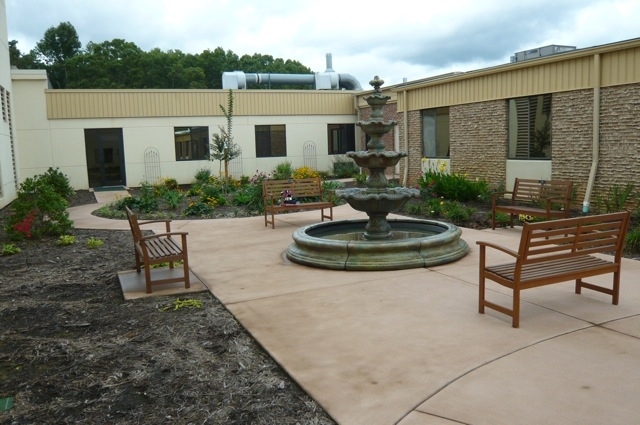 The location for this garden was selected due to the vast number of visitors to the beautiful Union County Farmers’ Market each year. 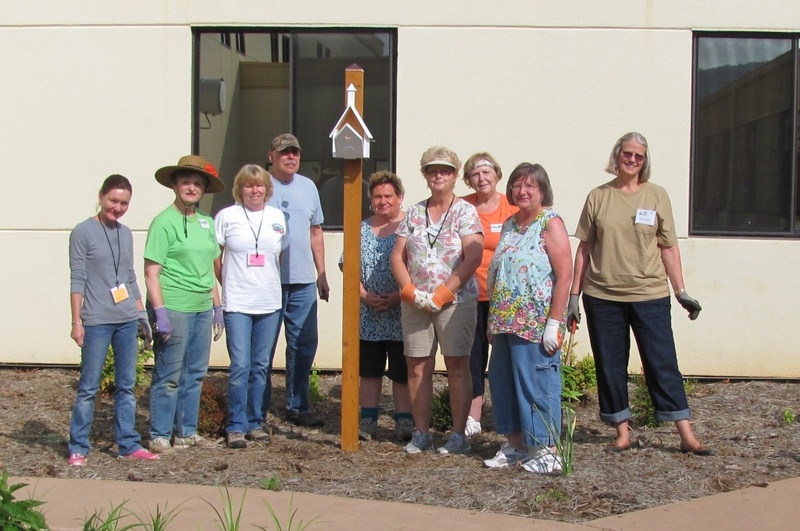 Thank you to the County for allowing the Towns & Union Counties Master Gardeners to provide the beautiful garden for all Union County residents. Our Garden invites you to walk the pathway in the Garden and enjoy all its beauty with the birds, butterflies and bees. The Glenda Gooch House: A gift from Glenda Gooch and her family which provides a warm, safe and comfortable home for families whose loved one is hospitalized at the nearby Union General Hospital without cost. 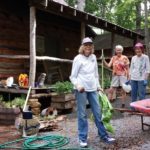 GMREC: MGEV’s serve as tour guides, assist in educational programs for school children, work in the preservation gardens, plus many other opportunities. 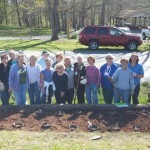 First Baptist Church, Blairsville – Members maintain two plant beds and assist with children’s raised bed. Also maintain four containers. Advise contractors. Nell Brown Dahlia Beds at Meeks Park & Union County Farmer’s Market: A family history of raising dahlias in Suches, Georgia is being perpetuated by Master Gardeners. 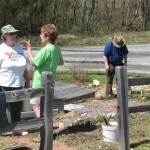 Farmers Market – dahlia bed has been weeded but could use a little more work, mostly under the split rail fence and in the big rocks next to the road. There is a newly discovered (by MGEVs) weed that is everywhere; also Johnson grass and pig weed. Generally, the tubers are slow to emerge. A few tubers have not sprouted but they are the late blooming ones. We should start having blooms around July 4th. All tubers were planted in two gallon pots with gravel in the bottom. The surrounding grass and planting area has been treated with a grub preventive and a Tom Cat © mole/vole preventive. 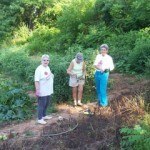 Anticipate pinching back some of the plants Tuesday June 21st at 8:30 am. MGEVs are invited. 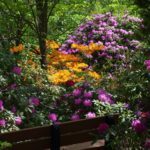 Meeks Park – dahlia bed completely weeded. The surrounding grass and planting area has been treated with a grub preventive and a Tom Cat © mole/vole preventive. Anticipate pinching back some of the plants Tuesday June 21st. We’ll meet first at Farmers Market and then move to Meeks. 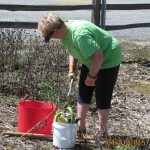 Lilacs – All lilacs are pruned in the Park and Susan J and Annette pruned a few bushes at the Senior Center June 9th but have about 12 more left. The big, full lilac bush that’s located about half way down has a bird’s nest in it with eggs. 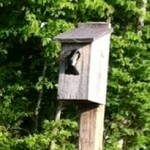 Susan and Annette were chewed out by mama bird the entire time we were deadheading it. 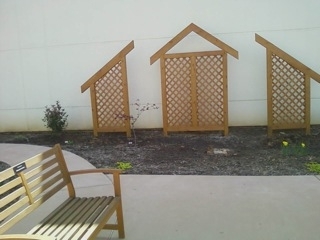 We’ll fix that bush later. 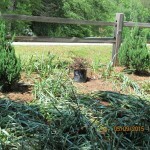 There are at least two bushes that are dead and will be dug up by the probationers. Larry Connelly has agreed to provide fertilizer, mulch and the labor after he has the grass treated for grubs. Roses – looks like the Knock-out Roses at Meeks have the virus; also think the ones at 1st Baptist have virus. Nell Brown, Annette Hopgood, Marcia Little, Rod Burley, Kay Burley, Pat Smith, Susan Jarocki and Cathy Haist. Nell presented her ‘helpers’ with certificates as Dahlia Dudes! Each dahlia planted has its own rebar/label like at the Farmers Market. Most are planted in 1.7 gal pots with three planted in hardware cloth. TUMGA purchased 30 – 6’ pieces of cut rebar; Barb has received donations of fertilizer and additional rebar from local businesses. Larry Conley with Parks and Recreation did a great job of preparing beds. 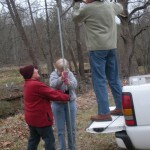 10-10-10 was added; Pat and Susan recorded the varieties for a diagram. If plants do not survive we will try to replace them with varieties I have started in pots at home. Nell’s goal was to plant all varieties at Meeks; I think we have planted all known varieties between the two beds. I have a number of tubers without names that I will plant at home and identify. If you’d like to give a home to an ‘unknown’ LET ME KNOW! Next year we might investigate a small bed to feature pink dahlias for breast cancer awareness. This idea was generated during planting! Thanks Pat. 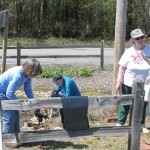 Susan and I went back to the FM and planted 6, 12, and 18-inch zinnias under the split rail fence at the bed. 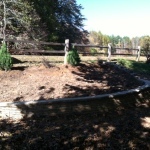 Susan raked the bed and filled in some sunken areas. 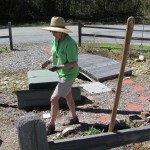 Susan and I may investigate some type of stepping stone between rows at FM. I will have a few tubers at the Thursday, May 14th meeting; others will be available again on 5-23 at Strawberry Day for any donation. 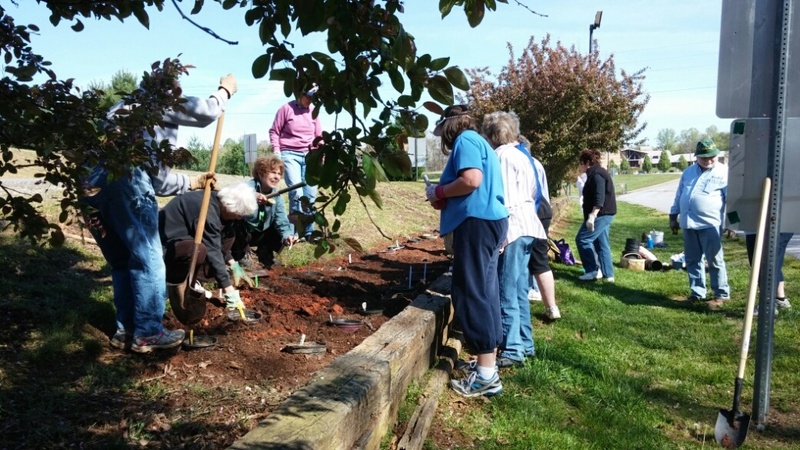 On May 5th members of the Towns-Union Master Gardeners met at the Union County Farmers Market to plant 2015 tubers. 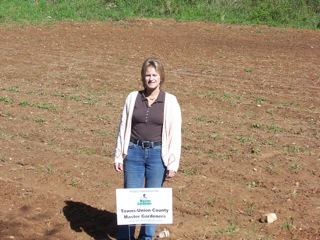 The soil had been prepared with lime last Fall and 10-10-10 this spring. 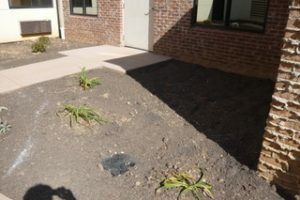 Weeds were removed. 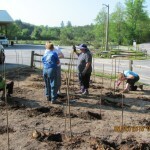 Stakes and cord established planting rows and distance between tubers – 4’ between rows and 4’ between tubers. 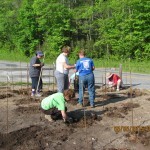 35 tubers were planted, representing 30 varieties of Dahlia. 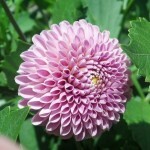 Dahlia tubers are from the Nell Brown stock. 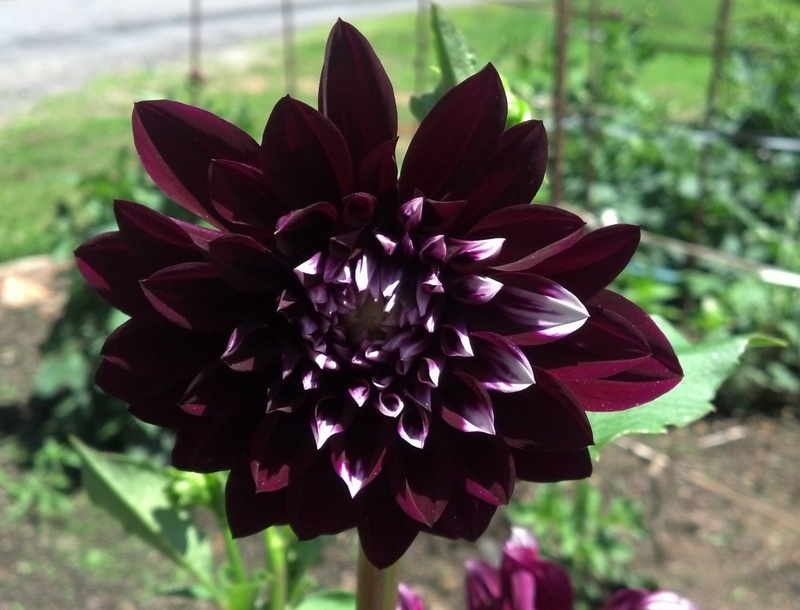 Nell’s Father operated the Todd Dahlia Farm in Suches. 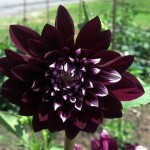 Nell began working with dahlias when she was 2 years old. 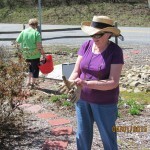 She is now 87 and master gardeners are helping her with her local beds. A second bed is at Meeks Park. Tubers were planted 2 inches below the ground with the sprout (from eye) facing up. ½ inch rebar were driven closed to the sprout so each new plant may be staked to the rebar later. More to come…… Next operation will be to groom the small plants and begin staking to the rebar. 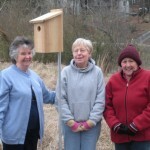 Members helping were Pat Smith, Marcia Little, Joan Pennington, Fran Browning, Susan Jarocki, and Annette Hopgood. Spouses Bert Baumgardner and Wesley Hopgood also helped. 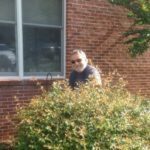 Union County Extension Office: : President Dan Greenfield was speaking with Jammie of the Union County Extension office and does she have a deal for those of us that are fed up with the heat but would like to log some hours. 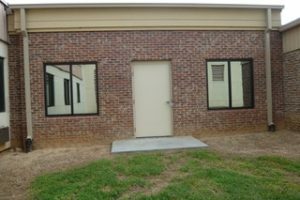 If you volunteer at the office you get the perks of air conditioning, free parking, and all that other stuff that can only be had at the Extension office in beautiful downtown Blairsville. Besides I’m sure Jammie could use the help on occasion. Please give this some consideration as we bear through the sweltering summer months. TUMGA Newsletter: A quarterly newsletter written by our members for the website. Contains many useful and interesting articles as well as project updates. 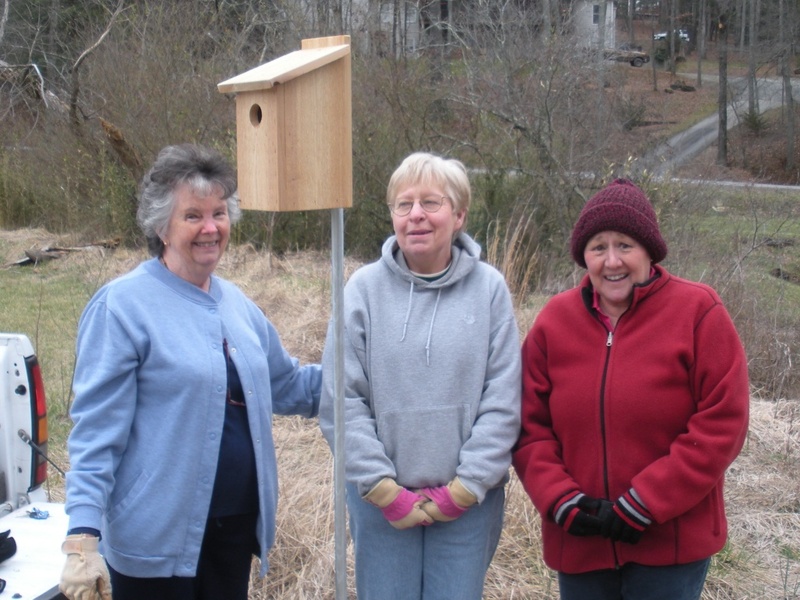 Union County Blue Bird Project: Education of the public on the ‘how to’ of preserving Eastern blue bird habitats in the community; We have installed blue bird houses at Union County Farmer’s Market and will be installing some on the dog trail at Meeks Park. 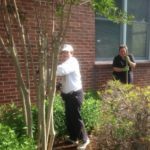 We continue to clean and maintain houses around the community. We are working in cooperation with Union County Commissioner’s Office. 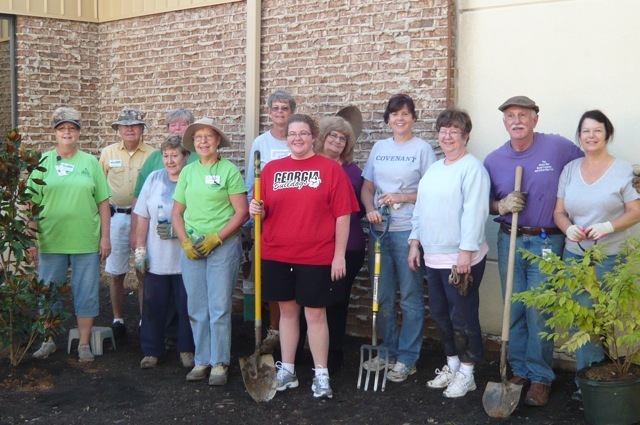 Sharp United Methodist Church: Assist the Church in the maintenance and beautification of the church property, usually twice a year. This is an ‘in-kind’ project in return for our monthly meeting space. A huge “shout out” and many kudos to the Master Gardeners who did grounds cleanup at Sharp UMC this morning. In less than three hours, the majority of the church grounds were refreshed. Beds were weeded, shrubbery was clipped, perennials were divided, etc. It was as if a total manicure was done. Some pictures of the MGs at work. After two previous attempts, we were finally successful this morning in completing our obligation to the church. 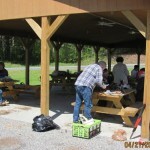 We do a grounds clean up twice a year in exchange for being able to have our monthly TUMGA meetings at the church at no charge. 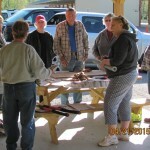 The church is most appreciative for its new “spring do Many compliments were expressed by visitors who came to do early shopping at the rummage sale. 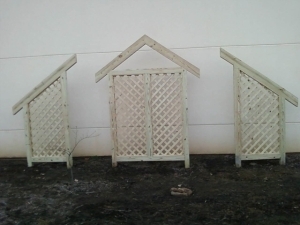 February 2016 update on Hamilton Gardens in Hiawassee. This has been a project for TUMGA for approximately five years and we have members of our group on the new board. Please check back for the next report on this wonderful garden in the near future. 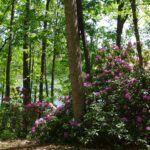 Last week, Georgia Mountain Fairgrounds, Inc. and the Georgia Mountain Authority officially turned over the operation and management of Hamilton Gardens, effective immediately, to Hamilton Gardens at Lake Chatuge, Inc., (HGLC) a duly authorized nonprofit corporation. 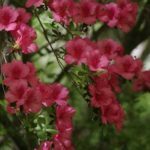 And so a new beginning is taking place as the HGLC, Inc. Board of Directors look to a future for the gardens that brings new ideas, energy, and excitement, while supporting the long standing primary mission to preserve and restore the gardens. 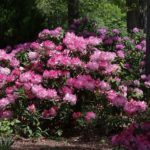 Fred Hamilton donated his collection of rhododendrons to Towns County beginning in 1982, with the understanding they would be cared for and preserved in perpetuity. 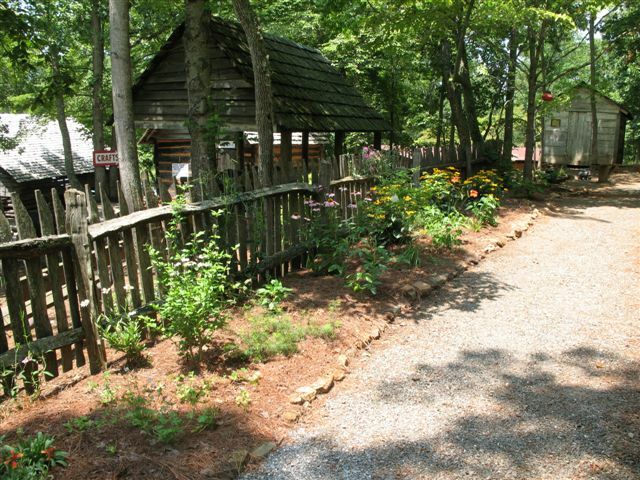 The gardens have been an important attraction in our community for a very long time, and are indeed old treasures which have been under the care of the Towns County Lions Club, and GMF, Inc. These two groups have spent countless volunteer hours over the years, working in support of the Gardens. The HGLC, Inc. Board of Directors is comprised of Grace Howard, Doug Canup, Martha Cunningham, Teresa Stephens, Marsha Elliott, Anne Mitchell, Joan Crothers, and Noel Turner. It is the belief of this Board that a garden needs many things to support it, the three most important being money, skilled labor, and passion. We have the passion and will work hard to obtain the other two. 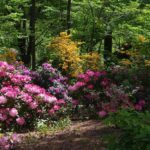 The website, www.fredhamiltongardens.org, and the Face Book page will be getting a facelift as part of the new beginnings. For more information contact us at HGLC, Inc. PO Box 973, Hiawassee, Ga. 30546. Stay tuned! 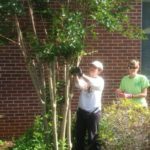 Crepe Myrtle Pruning: Annual pruning plus a public workshop on pruning techniques; and a bit of summer work to keep the ‘suckers’ cut back. 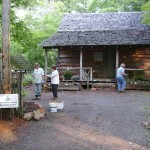 Pioneer Cabin and Gardens at GMF: Plan for the addition and planting of perennials this year in the cabin area. 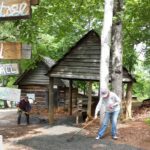 Finish the rock walkways around cabin. Prepare grounds for GM Fair and other events. 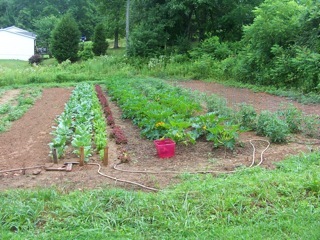 An Appalachian garden planted with vegetables of the era. 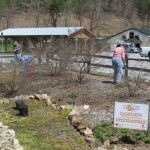 Spring clean-up, planting and mulching; harvesting of crops. 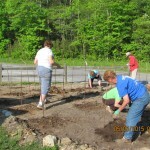 Work has been ongoing around the grounds and in the vegetable garden at the Pioneer House. 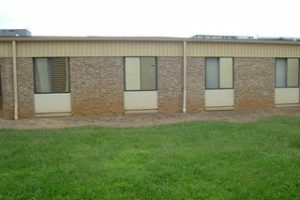 Several workdays have already been held, and two more are scheduled: Wednesday, July 6 and Wednesday, July 13 beginning at 9:00 am. 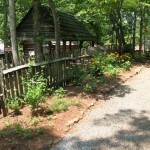 The beds still need some “prettying up”, bedding plants put out, sawdust moved along the paths, weeds pulled, etc. In addition, some carpentry work needs to be done on the MG booth to get it ready for company. Any contribution of time and energy and gardening/carpentry skills by any MG member would be greatly appreciated for these two workdays. 9:00 is the announced start time, but folks may certainly start earlier if desired. 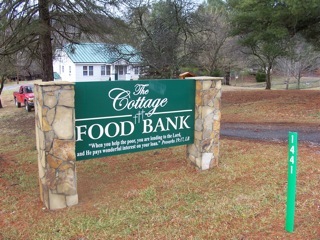 In 2011, Master Gardener’s started a garden for the House of Prayer’s Cottage Food Bank, located in Blairsville. 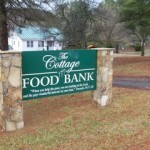 This was an effort to add fresh vegetables to canned and dry goods. 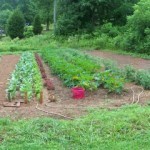 The garden produced 1,500 lbs of food it’s first year, consisting of zucchini, yellow squash, tomatoes and cucumbers. 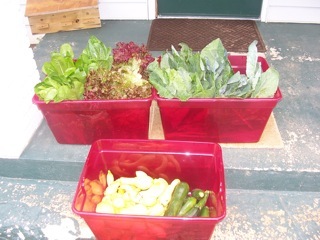 We also had an abundance of hot peppers, Romain and Red Leaf lettuce, and collard greens. Lisa DeCarlo, church member and fellow master gardener, applied for a scholarship and was awarded $650 from Ga. Master Gardener Assoc. 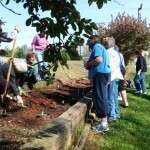 The funds will be used to create raised beds which we hope will double our production in 2012. To TUMGA members….. Good morning. I hope this finds you doing well and enjoying these lazy, hazy, crazy days of summer. 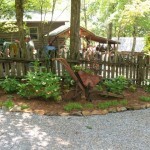 With it being summer, that means it will soon be time for the GA Mountain Fair. Such will be taking place July 21-29. Attached is the sign-up sheet for the “Ask a Master Gardener” booth at the fair. This is one of our big MG projects, and it will take many folks to cover the booth for the 9 days of the fair. The shifts are 4 1/2 hours in length, and those who work will be given a pass to use for the entire length of the fair. 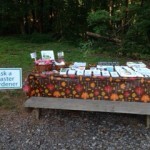 The GA Mountain Fair Fall Festival opened on Friday, October 7 and the “Ask a Master Gardener” booth adjacent to the Mountain Home opened as well. The booth is well stocked with a variety of printed information and very knowledgeable and enthusiastic TUMGA volunteers have signed up to “man” the booth for the eight days of the fair. All volunteer slots for “manning” the booth have been filled, and much appreciation is expressed to all who have volunteered to do such. 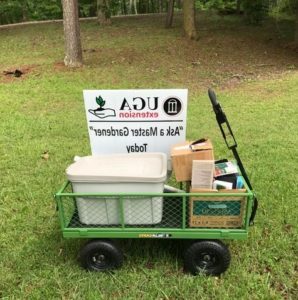 Hopefully the merits of the Master Gardener program will be emphasized during fair week by these wonderful “gardening ambassadors”. 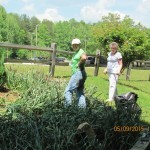 Sheleila O’Neal and others have worked hard to make the grounds of the mountain home “look good”. 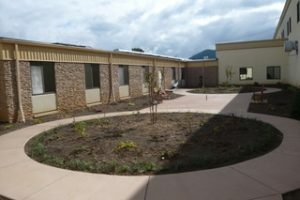 Certainly these two projects are outstanding examples of the work that is done by TUMGA members. 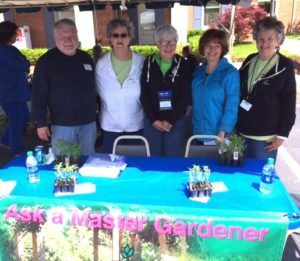 The Towns/Union Master Gardeners will operate an “Ask a Master Gardener” Booth during the GA Mountain Fair – July 15-23. The booth is located adjacent to the Pioneer House and will be manned/womaned during the eight days of the fair by TUMGA members. 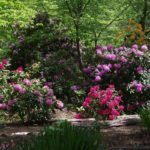 A variety of printed materials will be available, as well as knowledgeable and enthusiastic MG “gardening ambassadors” who will be on site to answer questions and offer gardening advice to the hundreds of visitors who come to the fair. 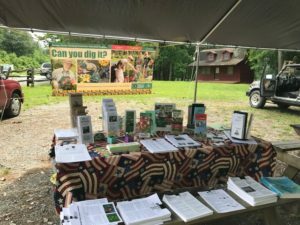 Doing this booth provides one of the largest venues to “educate and enlighten” the public about the joys and benefits that come from gardening. Shift times for the MG booth are 10:00 – 2:30 and 2:30 – 7:00. Hopefully the schedule for the booth is attached to this email. As you will note, there are still many “opportunities” to sign up to work one or more shifts during the fair. Please send Masha an email letting her know of times that you might be able to work and she will “pencil you in” on the schedule. Everyone who does work will get a pass/nametag that will be good for use throughout the fair. These will be available for pick-up at the TUMGA meeting on July 14. If for some reason, you will not be at that meeting, please let Marsha know and she will get the pass to you. 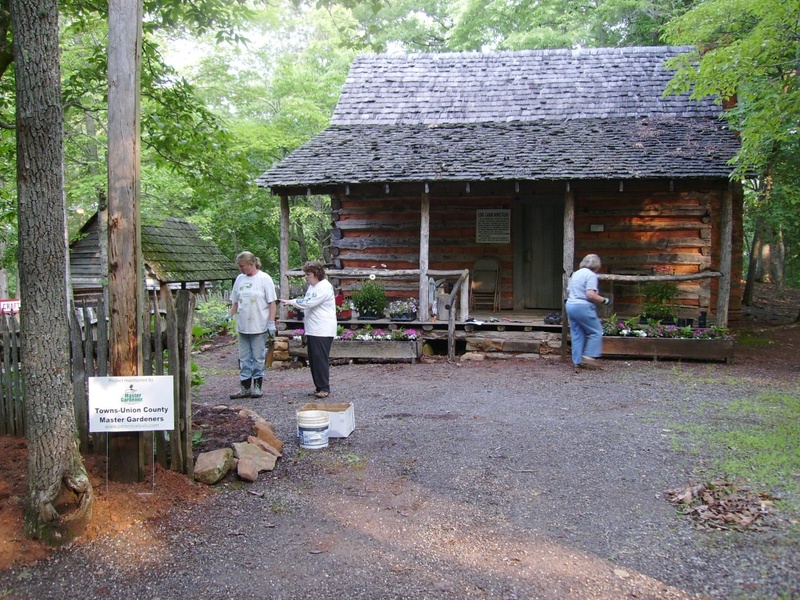 Master Gardeners chose the Pioneer House at the Ga. Mtn Fairgrounds in Hiawassee (Towns County) Ga. to create an example of perennials and annuals that would bloom in the Summer, during the Fair. We added flower beds and an herb garden. 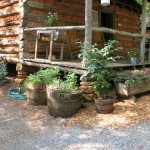 Large flower boxes were placed on the porch and filled with impatiens. 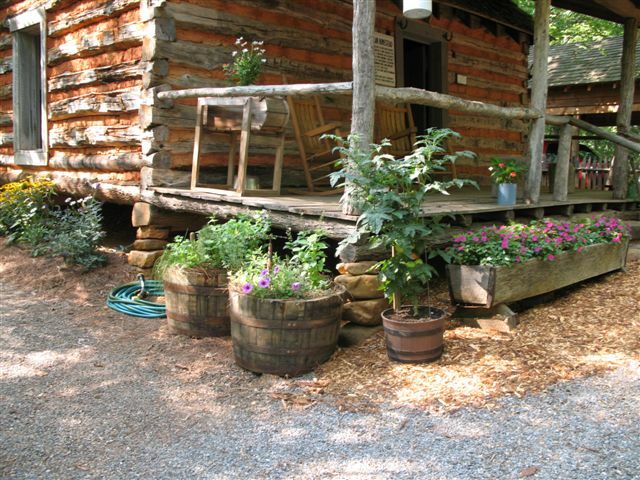 In 2012 we would like to expand the gardens to the rear of the cabin, and also plant a small vegetable garden to resemble one that would have been planted in pioneer days.